One of the elite Jumping horses of recent years is to bid farewell to the equestrian world this weekend when the fabulous SFN Zenith is retired in 's-Hertogenbosch. Jeroen Dubbeldam will bring the 15-year-old gelding to the Dutch event to allow fans to see their idol at a major event for the final time. The decision to retire the bay KWPN has been an emotional one for 2000 Olympic champion Dubbeldam. "Zenith has won almost everything that can be won at the highest level," said Jeroen, when announcing the retirement. "In one way or another it does not work anymore. Last year in Samorin I had a very good feeling in the Grand Prix, I thought we would drive zero, but there were still two poles. That was a real disappointment, I could always rely on my feelings. “Then I knew it was enough. I came out of the ring and said to Daniel Coyle, a student of mine, 'the party is over', where Daniel said 'but it was a good one'. Zenith was born in 2004 with Herman Voort in Den Ham and bought in 2011 by the Springpaarden Fonds Nederland (SFN). He teamed up with Dubbeldam for the first time in Verona in November of that year. Within three years he was a double world champion, scooping Team and Individual gold at WEG 2014 in Normandy. The relationship between Dubbeldam and Zenith was proven in the change-horse element of the Individual final at WEG 2014. Zenith, then 10 years old and the least experienced of the finalists, looked in supreme form with his usual partner on board but struggled a little when carrying rivals Beezie Madden and Rolf-Goran Bengtsson. He then recorded a fabulous clear with Patrice Delaveau which almost cost Jeroen the title! 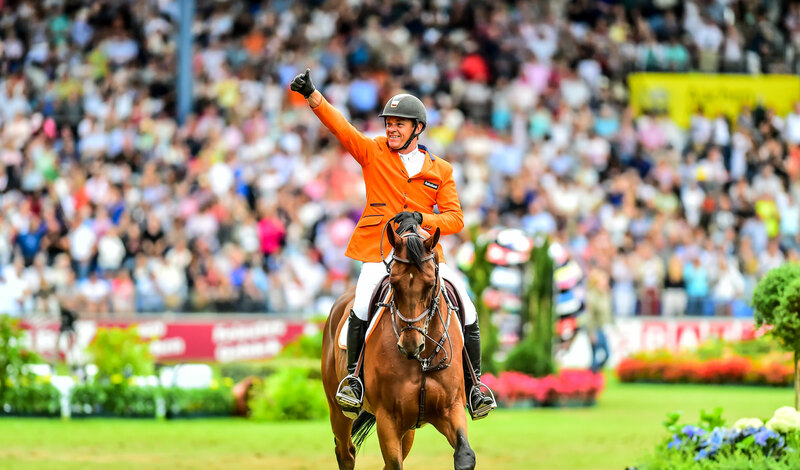 It was an incredible year for the pair as they were also a key part of the Dutch team that won that year’s FEI Jumping Nations Cup™ Final in Barcelona. After another brilliant clear round, Zenith and Dubbeldam were now regarded as the world’s best. This powerful bay built upon a triumphant 2014 by claiming FEI European Championships gold with Dubbeldam in Aachen 2015. They became the first Dutch duo to win the continental title since Johan Heins and Seven Valleys in 1977. They were a class above the rest of the field in Aachen, and the only combination to not bring down a single pole throughout the five days of competition. They headed off to Rio de Janeiro for the 2016 Olympic Games among the favourites. However, they finished 0.02 seconds over the allowable time in the second round which meant they did not make the jump-off and ultimately finished seventh. Dubbeldam was tearful as he departed the ring in Rio, fearing it would be his last ride with Zenith as there were plans for the gelding to be sold. However, a deal was struck with SFN that meant the pair could stay together. Zenith will be retired in style with Dutch singer Glennis Grace, a star of America’s Got Talent, lined up to perform a set at the ceremony.